Purchase these ornate aluminum vents and use them in your bathroom or kitchen since they will not rust. 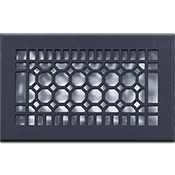 The decorative wall grille is made by Classic Grilles out of solid aluminum and is 1/4" thick, making it a durable unit. Our aluminum vents are all made in the United States, by way of a sand cast, and are hand crafted. Choose your decorative wall grille to come finished in painted white, black or brown or in its bare aluminum state. See photo of finish options below. The aluminum vents are not designed for floor use but can be used in your wall or ceiling. To install the decorative wall grille, use the screws provided and screw mount the frame into place. Note that the aluminum vents also are made with a screen backing to help hide the sight of your ductwork. Our decorative wall grilles will allow either hot or cold air to flow through the vent and out into your room. Tip: When ordering your aluminum vents, measure first the size of your wall or ceiling opening. The list size shown above is based off this measurement. The decorative wall grilles will have an additional 2 inches added to the list size for the border. Each aluminum vents overall dimensions may differ since these grilles are hand made. Important: Our decorative wall grilles are considered to be special order, non returnable items which cannot be canceled after payment has been made. The aluminum vents will ship out between 7 to 9 weeks after an order has been received. Our octagon vent also is offered as a wall register which comes with an opening and closing damper. To match decorative wall grilles to the multiple styles of your home, check out the other options offered by Classic Grilles for wall vents. Turn these aluminum vents into a stylish feature on your wall and impress your family and friends with its unique look.